A.J. and his family are from nearby Delaware, although, it took visiting relatives from Long Island, NY to learn about CPL. A.J.’s parents mentioned in casual conversation that they were thinking of adding a dog to the family and their relatives suggested they look into CPL which happened to be very close to home. A.J.’s parents always had a love for dogs but were concerned about adding one to the family because of the “puppy” stage. The extra excitement of having a young puppy and the sharp teeth could have caused additional anxiety for A.J. who has Fragile X Syndrome. It is a genetic condition so it was onset at the time of conception but he was not diagnosed until he was almost three years old. Fragile X Syndrome is the most common known single gene cause of Autism Spectrum Disorders worldwide. The condition can also cause intellectual disabilities, speech delay, hypersensitivity to certain noises and lights, ADHD, and anxiety. As A.J. started to get older, his parents witnessed him interacting with his neighbors dogs. He would stop to pet them and even take the dogs for walks. They knew it was the right time to add a dog to their family and when they found CPL it was the perfect match. A.J.’s parents originally wanted to apply for a released dog but after doing some research into CPL’s programs, they realized A.J. would be a candidate for a home companion dog. After being on the waiting list for just over two years, A.J. was matched with Kody, an active Yellow Labrador. The two met at CPL and A.J. had a smile on his face the entire way home which helped to ensure his parents that Kody was the right match for their family. When Kody moved into their home, the first thing A.J. said was “I need a bigger bed so Kody can sleep with me!” His wish soon came true. Within a week of receiving Kody, A.J. moved to a bigger room with a queen size bed. The two now sleep together every night! 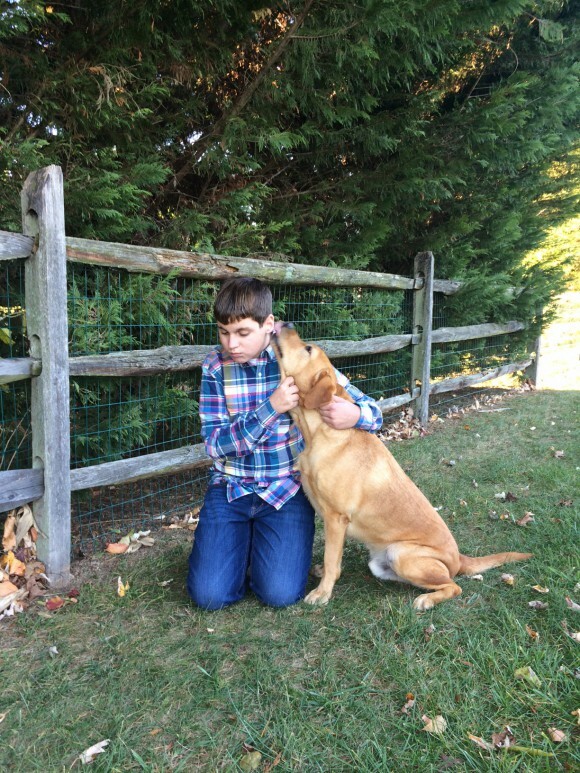 A.J.’s mom shared in their application to CPL, “We feel this dog will not only provide A.J. with a companion since he doesn’t have any siblings, but a sense of responsibility and reciprocated love.” Kody has done that and more! 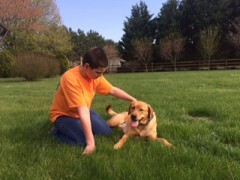 Kody is an incredible companion for A.J. and has made him even more active then he already was. Kody greets A.J. each day when he gets off the bus. The two will often play together in the yard and take walks through their neighborhood but their favorite activity is swimming. Over the summer, they spend most of their weekends at their beach house and on the boat. During Kody’s first trip to the beach, he was unsure of the water but A.J. quickly assured Kody that he naturally knew how to swim and now they are in the water as much possible.